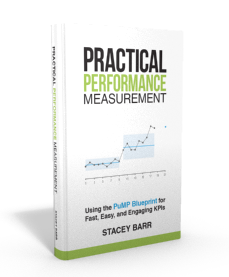 When KPIs are not achieving their targets, performance improvement is needed. But rather than rushing to solutions prematurely, we need measurement for diagnosis. Most of my work in performance measurement is about how to meaningfully measure results, the things we want to achieve or improve or even excel at. And because of how many organizations still struggle with that, that keeps me plenty busy. But I started my career as a research statistician, and I was using data to explore and diagnose problems. I know that measuring results is definitely not the only thing we should do with data. We only get a big return on performance data when we use it to drive performance improvement. 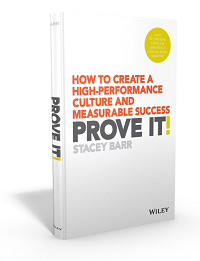 Performance improvement means reaching for, and ultimately achieving KPI targets. If we have a culture of hitting targets, we end up driving the wrong behaviours (known as “gaming”). But if we can encourage a culture of reaching for targets, we encourage learning and continuous improvement. Targets are often achieved in iterative steps: one performance improvement project after another. And each performance improvement project will succeed at helping us learn and improve performance when we use the right tools to guide it. This is what measurement for diagnosis is all about. There are two stages of using measurement for diagnosis, to achieve our KPI targets. Understand potential causes holding performance back from target. Find out which are the biggest causes to fix first. Analyse the biggest causes to choose improvement actions. I interviewed Mike about how he uses measurement for diagnosis, which you can listen to (and see examples of each tool) at the bottom of this article. In the meantime, here is a summary of Mike’s advice about using measurement for diagnosis. Stage 1: Understand potential causes holding performance back from target. Flowcharting, where you map out the steps of the business process that relates to your performance measure. These are great for understanding how work actually happens, and quickly seeing likely problems that constrain performance. Ishikawa or fishbone or cause-effect diagrams, where you use a comprehensive framework of cause categories to prompt likely causes in your process. These are great for being thorough and making sure you don’t overlook any important causes. Stage 2: Find out which are the biggest causes to fix first. Tally sheets are simple, basic ways to capture enough data to quantify how often each potential cause actually occurs. These are great for quick and easy data collection you might only need for a temporary period of time. Pareto charts are the best way to then visualise the cause data from tally sheets. They are bar charts of the number of occurrences for each cause. And they are ordered from most to least, to highlight the biggest causes. These are great for diagnosing 20% of causes that create 80% of the problem. Stage 3: Analyse the biggest causes to choose improvement actions. Histograms show the pattern or spread of variation in a measure. These are great for diagnosing if a causal measure is skewed, highly variable (or chaotic), or affected by outliers. The patterns in a causal measure can be clues about why it’s affecting the KPI. Scatter plots show the correlation between two measures, like a measure of a cause and a performance measure. These are great to test the strength of relationship between a cause and your KPI. Control charts track a measure over time, to understand its variability. These are great for diagnosing changes in a measure over time (using signals that are statistically valid). I love these charts, particularly the XmR chart (which I’ve written lots about). Measles charts help to plot a measure on a geographical or locational map. These are great for diagnosing where a cause might be at its worst, and clues as to why might lie in the location. Spaghetti charts plot movement among a collection of points, like rooms or equipment on a floor plan. These are great for diagnosing where time might be wasted, like if a space design isn’t efficient for how the space is used. Do you use measurement for diagnosis? Or do you rush to solutions prematurely? What diagnostic analysis tools or techniques do you find invaluable for performance improvement? Thanks for this great blog. There’s two critical things in this space: choosing good KPIs, and training management to use them correctly. It amazes me that after 50 years promotion and education about ‘TQM’ and ‘Business Excellence’, the most common response to falling short on a KPI is to find someone to ‘discipline’ or fire. I see one of the primary roles of Leadership as being to coach their people to understand the factors that drive outcomes and to implement effective management practices using indicators of those drivers to adjust and adapt resources, process and systems to achieve best possible outcomes. How refreshing that someone with Mike’s specialist experience confirms that the ‘Seven Tools of Quality’ from the 1980s, with the addition of the very pragmatic ‘Measles’ and ‘Spaghetti’ charts still meet most of the needs for good management of processes! I’m always suspicious when I hear people demanding ‘accountability’ because it is most often the flipside of ‘blame someone’. Principled Leaders might well reflect on their own accountability for not teaching the tools and methods that have been established good practice for 50 years. Colin, I’m with you. This is the number one struggle I have in my work, in trying to make a difference. It’s totally baffling why after 50 years of a field filled with common sense (TQM etc…) the majority still don’t get it. What’s the cause we’re missing?